As a youngster, I developed a recurring nightmare inspired by two traumatizing episodes of Nickelodeon’s Are You Afraid Of The Dark?, a hair-raising children’s horror anthology series that was easily one of the network’s best and most well-known shows during its golden era of programming. During the early ’90s, any self-respecting kid in a cable-subscribing household knew the cool thing to watch on weekends was SNICK, Nickelodeon’s Saturday-night block of original programming aimed at the tween and teen audiences. As a 6-year-old in 1994, I wasn’t even close to the cusp of those demographics, but my friends and I watched religiously, even though Are You Afraid Of The Dark? was the primary reason I slept with a lamp on every night. 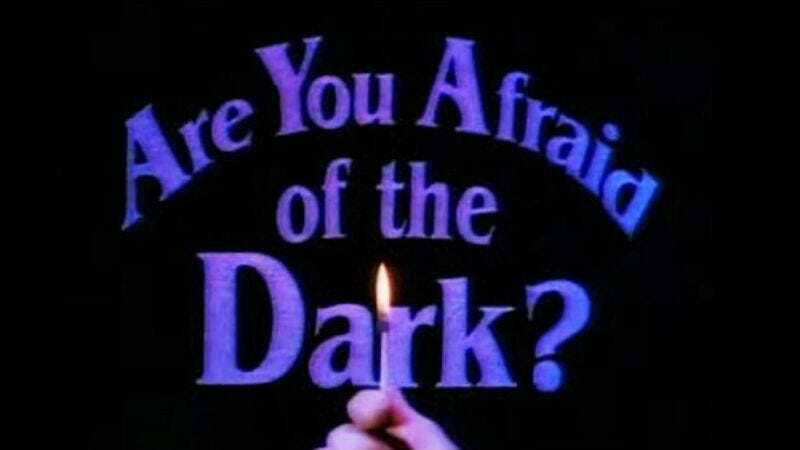 When SNICK debuted in August of 1992, Are You Afraid Of The Dark? premiered with it. (The series’ true pilot, “The Tale Of The Twisted Claw,” previously aired on Halloween in 1991.) AYAOTD was one of Nickelodeon’s few attempts at dramatic live-action programming, and it quickly became one of the network’s most successful shows. Running for an impressive 91 episodes across seven seasons, AYAOTD even survived cancellation following its fifth season thanks to a network licensing negotiation that resulted in a series reboot from 1999 to 2000. The series also regularly attracted its share of famous (for that era) guest stars, including Frank Gorshin, Gilbert Gottfried, Bobcat Goldthwait, and Melissa Joan Hart. But it’s also noted for helping launch the acting careers of a handful of Canadian teens, including a pre-Party Of Five Neve Campbell, Ryan Gosling, Jay Baruchel, and Emily VanCamp. Created by Ned Kandel and D.J. MacHale, the series’ longtime showrunner, writer, and frequent director, AYAOTD was first conceived by MacHale in 1989 while writing for the Encyclopedia Brown series on HBO. But MacHale’s initial idea for a children’s program couldn’t be further from the show Nickelodeon eventually picked up. MacHale originally developed AYAOTD as a Masterpiece Theatre-styled surrogate for parents too busy to read bedtime stories—why not simply plant children in front of the TV set and let an aged actor in an armchair read them some fairy tales? However, it was during the early stages of writing this incarnation that MacHale realized he was writing the wrong show: The only stories he ever liked as a child were scary ones. Consequently, MacHale altered his series pitch into a kind of kiddie version of Tales From The Crypt. He ditched the old man in the armchair and replaced him with a group of kids—all of them apparently without curfews—who told campfire tales in the middle of the woods. He called them the Midnight Society and gave them diverse personalities that would inform the stories they told each week. Gary was the nerd who liked science and magic; he told stories featuring magic-shop owner Sardo (“That’s SarDO! No mister, accent on the ‘doh’”). Betty Ann was the mild-mannered girl who specialized in twisted stories of supernatural spaces and beings. Kiki’s characters were frequently people of color who usually had to make up for a past misdeed. And as an ode to Rod Serling and The Twilight Zone (a major creative influence on MacHale), the storyteller of each episode began his or her tale with the words, “Submitted for the approval of the Midnight Society…” before the on-screen action shifted to the story being told. The Twilight Zone influence is never more present than in “The Tale Of The Super Specs.” When Weeds (Eugene Byrd of Fox’s Bones) uses some magic sawdust to perform a voodoo spell, he accidentally imbues a pair of “x-ray vision” novelty glasses with the power of “second sight.” Soon, Weeds’ girlfriend Marybeth begins seeing hooded figures clad only in black who do disconcerting things like play basketball, boil tea water, and point at her whenever she puts on the enchanted eyewear. For any latchkey kid who spent afternoons alone, “Super Specs” was a freakishly disturbing episode. It’s also an episode that’s casually racist and casually ripping off John Carpenter’s They Live. More than that, “Super Specs” is one of a handful of noteworthy episodes that do not conclude with everything being okay for the put-upon teenage protagonists. Although most episodes typically worked out in favor of the protagonists, AYAOTD wasn’t afraid of reminding kids there are no guaranteed happy endings in life. It’s this kind of refreshing confidence in its audience and courage in its storytelling that made the show such a joy to watch then, much as it is now. Perhaps unsurprisingly, when MacHale and Kandel first pitched AYAOTD to Nickelodeon in 1990, the network execs gave them a quick rejection with one simple explanation: “You can’t scare kids.” Oh, but you can! And Are You Afraid Of The Dark? became mercilessly good at it once Nickelodeon execs changed their minds. A stylistic effect the series excelled at producing was the sensation of the uncanny. A concept popularized by Ernst Jentsch and Sigmund Freud, the uncanny arouses feelings of discomfort and “intellectual uncertainty” when something familiar is made foreign and unnatural. For AYAOTD, the quiet, middle-class neighborhoods of Quebec were the perfect settings for the uncanny to unfold. Jentsch and Freud both referred to the E.T.A. Hoffmann short story “The Sandman” to demonstrate instances of the uncanny. One of the literary devices Jentsch examined in “The Sandman” was the inclusion of an automaton or lifelike doll in a story. All anthropomorphized creatures of supernatural origin fit the bill, from werewolves to Dracula to Frankenstein’s monster; clowns, another commonly feared figure, also apply. The uncanny is inspired by the discordant juxtaposition of familiar human features with unnatural or repulsive features. The same can also be said of locations or events. By situating episodes in the everyday suburban lives of teens and preteens, AYAOTD was able to distort and disorient the familiar locations of homes, schools, and malls, as well as the comfortable routines of classes, dances, and after-school jobs. The series’ masterful exploitation of the uncanny frequently led to raised eyebrows from my parents, who watched episodes with me. I’m sure they asked themselves, “Is this really for children?” Watching the show now as an adult, I can answer that question with a resounding yes. The series was absolutely designed for children. With the series so focused on teaching moral lessons and adolescent conflict resolution, it’s difficult to connect with the storylines post-middle-school graduation. AYAOTD, like all children’s programming, strategically engaged kids with characters and plot points that were relevant and easily identifiable. What made the show remarkable was how the supernatural and science-fiction elements were introduced as a means of teaching lessons and heightening the dramatic tension set up earlier in the episodes; the show was rarely written just for the sake of the scares. This sophisticated, consistent method of horror writing across the series is an integral part of how and why the show works. In “The Tale Of The Midnight Ride,” the episode quickly establishes within the first few minutes that Ian, the new student at school, is a bit of a geek and not exactly popular, so he’s desperate for friends—something almost all kids will experience at some point in their youth. When Ian meets Katie and she takes an instant liking to him, her tough-jock ex-boyfriend Brad threatens Ian and decides to pull an embarrassing Halloween prank on the new kid in town—but their town just happens to be Sleepy Hollow. The Headless Horseman’s arrival helps Ian prove to his new classmates that he’s a lot tougher than he looks, and also helps him win the girl. The episode is effective because the real stakes in the episode aren’t “Will Ian survive the Headless Horseman?” They’re “Will Ian be able to fit in at his new school?” The Headless Horseman is merely a device used to impart a fresh context to the new-kid-in-school archetype. Kid-friendliness and morals aside, parents still did double takes over the audacity of the show. The series confronted children—and parents for that matter, given the number of “stolen children” episodes—with their most basic fears, and it didn’t pull its punches very often. Yet in its day, AYAOTD received heaps of praise from television critics, parents, and parenting magazines for tasteful storytelling techniques that exercised kids’ imaginations without resorting to cheap scares using violence, blood, and gore. The creative team behind AYAOTD understood better than most creators of horror—then and now—that the most basic and effective fear is fear of the unknown. And for a Canadian-American co-production with comically limited production values, that was a pretty beneficial concept to grasp. For instance, in “The Tale Of Laughing In The Dark,” the second episode of the series, the edges are rough and the low-budget cartoonish production values are on full display—not to mention the age of the series. On a dare, Josh (Christian Tessier of the Battlestar Galactica reboot) nicks the red nose off Zeebo the Clown, a funhouse dummy monster at a local carnival. Zeebo promptly tracks Josh down to get his nose back. But apart from the inanimate dummy and a blink-and-you’ll-miss-it apparition in a mirror, Zeebo is never really a visual threat. Instead, Zeebo spends most of the episode menacing Josh through a series of off-camera threats. He replaces a bowl of spaghetti with burning cigars and inflates a balloon into Josh’s bedroom via the crack under the door, with the words “give it back” written on it. Yet these restrained scares worked; they piled on the suspense. By my adult standards, however, this episode is pretty tame. Then again, unlike some people, the sight of clowns does not paralyze me. However, there were occasional episodes that pushed the boundaries of good taste when it came to PG-rated horror, especially in later seasons when the Midnight Society cast was getting older along with the fans. By the third season, the stories had shifted focus away from child protagonists with sibling squabbles toward teen protagonists with high-school dilemmas, usually of a romantic nature. But with “The Tale Of The Night Shift,” one of a handful of episodes that tackled the vampire subgenre, it’s easily the boldest and most violently adult episode the series ever conjured for its TV-Y7 audience. As one of the last episodes of season five, “Night Shift” features an utterly terrifying red-eyed, green-faced vampire who threatens to drop a teenage candy striper (Emmanuelle Chriqui from Entourage) off the roof of a hospital and lick up her bloody remains—all before he bursts into flame and falls to his own doom. Having the nerve and also the necessary craft to scare children without scaring them away is admirable, regardless of how the series has aged, or how hokey some of the acting, sets, and costumes were. AYAOTD taught young Nickelodeon fans what the bogeyman looks like (he’s a non-speaking Québécois actor under heavy make-up), and was the root of several childhood bad dreams. The show took kids seriously and rarely condescended. The writers knew we watched because we wanted to be scared, and the show almost always delivered. In fact, the episodes delivered so impeccably that many of them—and the attendant shivers of fear they produced—still linger memorably 20 years later.